We once heard it theorized that the 24-hour clock and Gregorian calendar are Christian inventions and designed to keep humans out of synchronization with their real place in time and space. It is believed by many in esoteric circles that space and time are creations of our minds and that they may not really exist. Anyone who has traveled out of the body and had contact with life forms on the astral or spirit plane is aware of the fact that time there is non-existent. It also is possible for a person in that state to travel instantly anywhere, even to a distant planet, by merely thinking of it. So why would the creation of the 24-hour clock and the 12-month calendar be a problem for us? After all, we have lived under these rules of set time for centuries and our way of life, from the time we start school until the day we retire from our job, is controlled by them. We all know, however, the unwelcome sound of the alarm clock that signals the start of a new working day. We know the feeling of crawling out of our beds before our bodies are ready to give up precious sleep time to meet the demands of a time clock at some distant work place. Those who work swing shifts, experience jet lag after a flight across world time zones, or stand four-hour watches on ships at sea, understand all too well the effects constant disruption of body biorhythms can have on both mind and body. Suppose there is a more natural circadian biorhythm for humans that, if known and followed, would create a more perfect pattern for our existence, and help us become more aware of the true spiritual path we should be taking? Is there a natural lifestyle pattern that would allow us to spend each hour of each day more productively and creatively? Imagine living without clocks and choosing our own time to sleep and wake up, and even choosing when we report on the job. Indeed, there have been scientific studies conducted by people who have sought answers to these very questions. Perhaps the most interesting study was made by French geologist Michael Siffre, who in 1972 moved into a cave and separated himself from all outside influences for seven months. He took with him adequate food and drink, exercise equipment and a telephone line to the outside world through which he reported his daily and nightly activities. There were instructions that he was not to be given clues as to the time. He did not have a clock or any means of determining the time of day, or day of the week. The cave was equipped with artificial light which Siffre controlled. It was in this environment that Siffre went about daily chores, preparing meals, and choosing when he would sleep and arise to begin each new day. The experiment revealed something interesting. Over a period of time his body clock moved from a 24-hour cycle to a 25-hour pattern. He was going to bed about one hour later each day. After 12 days in the cave he was going to sleep at about noon and waking up at midnight. Within three weeks he lost a complete day. While all humans are different, and we may all have our own unique circadian rhythm going on, the Siffre experiment clearly suggests that the 12-hour day may not be the right pattern for us to be clinging to. And if we must have it, perhaps employers would get better performance from workers if they were allowed to choose their own working hours rather than punch a time clock. This writer has battled a unique sleep pattern most of his life that completely violates all the rules. It appears normal for me to sleep for brief periods, and then get up and go for several hours or more before crashing to sleep again. I have attended sleep clinics and been treated for narcolepsy although I never believed this was the right diagnosis. To combat what, to me, would have been a normal biorhythm and fit into the demands of the society I live in, I use stimulants to work through a “normal” day, and sleeping pills to make myself stay asleep through the night. Is my sleep pattern that strange? A check on the Internet revealed a web page by a person who identifies himself only as Andrew, who recorded what he called a polyphasic sleep experiment for over three years that he said he got quite used to. It involved various naps during the day and night, and an active life style in between. In his blog Andrew noted that inventor Thomas Edison and the great artist Leonardo DaVinci remained awake most of the time, taking short naps when they felt tired. Andrew and others like him have been experimenting with something called The Uberman Sleep Cycle, where people optimize shorter periods of useful sleep and create more time to stay awake, productive and active throughout each day. They theorize that humans once slept during the night because they had no artificial light and the night hours, for them, were dangerous to be out and about. Such patterns are no longer necessary today. Experiments with the Uberman Sleep Cycle have shown that humans quickly adjust to the short spurts of sleep, and enter the necessary REM cycle more quickly, thus they do not lack in the important repair portion of sleep. Society, however, works on that 24-hour schedule, which may be next to impossible to change without everyone going through a dramatic shift in consciousness. 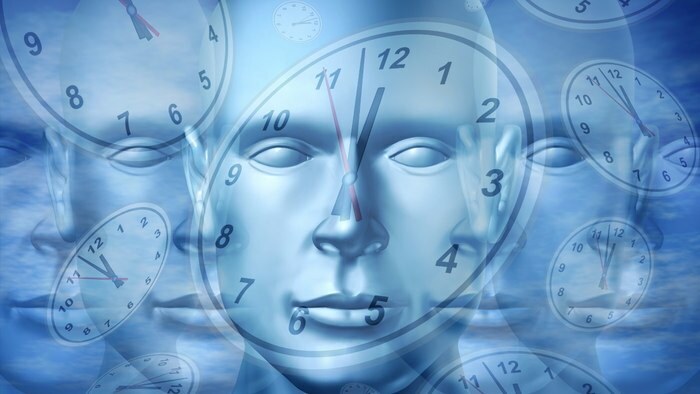 As long as we continue doing this to ourselves, people who must punch clocks or meet time schedules on the job find themselves constantly out of synch with the natural biological rhythms of their bodies. And as long as they must do this, it will be difficult, if not impossible for them to get a clear bearing on just where in time and space they are. This may seem like a strange argument since the movements of our clocks are based upon the natural rotation of the Earth, which is close to a 24-hour day. Getting the exact time in which the Earth rotates on its axis is somewhat complicated because of the way the planet constantly tilts. Also astronomers say the Earth is slowing in its speed of rotation by about 2.2 seconds every 100,000 years. Currently a complete rotation of the Earth takes 23 hours, 56 minutes and 4.06 seconds. Why did the Saffre cave experiment suggest a natural circadian rhythm of 25 hours in a day instead of 24? The only planet in our solar system that rotates on a 25-hour day is Mars, and space probes have shown that humans do not appear to have had any origins there. Or did we? Science has discovered that there is a lasting cellular memory in all living things that appears to go back to our distant past. Since it exists on Earth, we must assume that pre-biotic chemistry of life may also exist on Mars, even though the planet will not support life. The discovery of a meteorite in Antarctica in 1884, found to be a fossil containing microscopic signs of possible life that originated from Mars, suggests that the chemistry of life that now exists on Earth may, indeed, have originated from Mars. Perhaps it was a collision of planets, or a strike by a large space rock that forced particles of Mars off into space. Some of these particles fell to Earth, bringing with them the pre-biotic chemistry from which sprang life as we know it. If we evolved from that Martian chemistry, it might explain why we have a cellular memory of a 25-hour day rather than the 24 hours that exists on our own planet. Are we then, in some strange sense, Martians?